March 6, 2009. It was previously reported here that AJ bought Stan Secora's Jato in the early 1970's from an intermediate owner. This is now in considerable doubt as two other sources indicate that this is not so. Nevertheless we will post a picture of Jato pending the possible arrival of a picture of Aye Jay from grandson Rick Bernstingle. Rick reports that Alex, who lived an active old age and died at 96, raced Atlantics at Niantic Bay YC (click here to find out more about Atlantics), liked to call Aye Jay his beer carrier. Aye Jay was sold years ago and her whereabouts are unknown. December 10, 2012. Just because a lot of time passes on these updates doesn't mean that staff is not on the trail. We spoke with Rick again and have information confirming Aye Jay was an early Marscot/O'Day or Lunn built boat. Her companionway had straight sides, not tapered outward, and she had wood coamings, not teak capped fiberglass coamings. Her deck was bone colored and she had a royal blue boot stripe (see Identifying Characteristics). 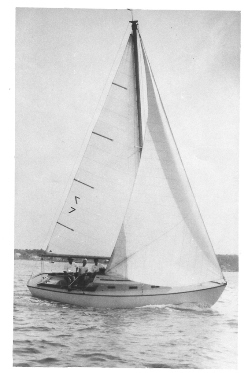 She also had the 'one lunger' inboard - most likely the Palmer 27.